Stacking the two consumer goods titans up against each other. 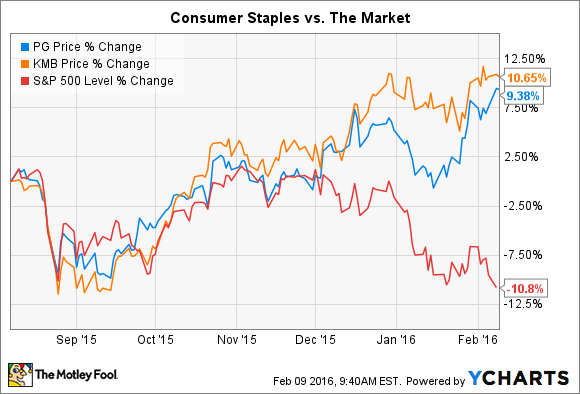 The consumer goods sector has held up well through the recent market carnage. 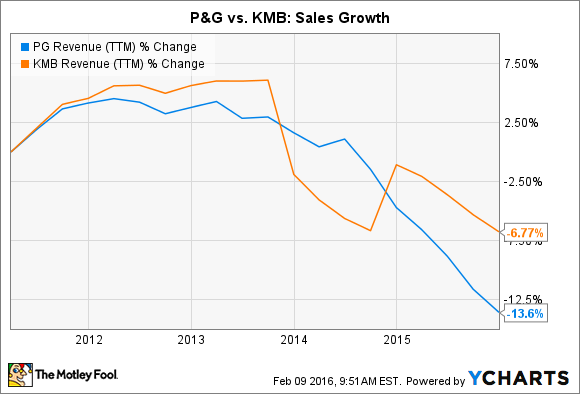 Rivals Procter & Gamble (NYSE:PG) and Kimberly-Clark (NYSE:KMB) are up 10% in the last six months, compared to an 11% dive in the broader market. From their strong dividends to their rock-solid balance sheets and reasonable valuations, it's easy to see why investors would flock to these consumer staples giants as stocks sink. But which one is the better buy right now? Sales growth is for the last complete fiscal year. Profit margin is over the past 12 months. Data provided by S&P Global Market Intelligence. Investors who value efficiency should prefer Procter & Gamble. After all, the consumer titan's 49% profit margin trounces Kimberly-Clark's 36%. And P&G is set to widen this gap even more over the years ahead. CEO David Taylor and his executive team are now done shedding the company's worst-performing brands, leaving just 10 umbrella categories for P&G to compete in. These segments are packed with blockbuster franchises like Tide, Gillette, and Pantene, which management selected for their above-average profit growth potential. Shareholders should start seeing this transition pay off in the years ahead as P&G's overall profitability rises. Meanwhile, cost cuts promise to have the same effect on margins. P&G has sliced billions out of its expense structure, and is on pace to slice even more out through the next two years. You can't really see the result of all these cuts because foreign currency swings are having the opposite effect on profits. But once those exchange-rate issues subside, the path is clear for major earnings growth at P&G. Kimberly-Clark dominates this match-up with regard to revenue growth, though. It posted a 5% bounce in organic sales last year, compared to just 1% for P&G. Look closer at the organic growth figures and you'll see that Kimberly-Clark is ahead not just on quantity, but on quality as well. The company managed healthy sales volume gains in each of its key product categories last year. That boost combined with slight price increases to produce the 5% overall growth figure. In contrast, P&G's volume fell across its business segments, and so it has been relying completely on price hikes to achieve any sales growth. Looking ahead, P&G sees another potentially flat growth result for its fiscal year that ends in June, while Kimberly-Clark sees organic sales improving by 3% to 5% in 2016. Mr. Market is currently offering investors Kimberly-Clark's business for 21 times the $6.10 per share that it is expected to earn this year, a relative bargain compared to P&G's 23 times earnings valuation. But I see a few reasons why that premium might be worth paying. P&G's significantly higher dividend yield is one, even if its payout ratio has climbed to distressingly high levels recently. Second, sales and profit growth could both start improving next year thanks to that stronger brand portfolio and those falling costs. And finally, foreign currency swings and brand divestments have temporarily hurt both earnings and sales, making P&G seem more expensive than it really is on a price-to-earnings basis. Bottom line: While either stock is a good choice for conservative investors looking for steady growth and above-average dividends, my view is that P&G is the stronger choice at today's prices.